During the First Serbian Uprising, Serbian revolutionaries held the city from 8 January 1807 until 1813, when it was retaken by the Ottomans. After the Second Serbian Uprising in 1815, Serbia achieved some sort of sovereignity, which was formally recognised by the Porte in 1830. In 2014, Belgrade Waterfront, an urban renewal project, was initiated by the Government of Serbia and its Emirati partner, Eagle Hillls Properties. Aimed at improving Belgrade's cityscape and economy, the project hopes to revitalise the Sava amphitheatre, a neglected expanse on the right bank of the Sava river between the Belgrade Fair and the former Belgrade Main railway station. Around €3.5 billion will be jointly invested by the Serbian government and their Emirati partners. The project includes office and luxury apartment buildings, five-star hotels, a shopping mall and the envisioned 'Belgrade Tower'. The project is, however, quite controversial—there are a number of uncertainties regarding its funding, necessity, and its architecture's arguable lack of harmony with the rest of the city. Belgrade is the financial centre of Serbia and Southeast Europe, with a total of 17 million square metres (180 million square feet) of office space. It is also home to the country's Central Bank. Currently, over 700,000 people are employed in 120,286 companies, 60,000 enterprises and 50,000 shops. The City of Belgrade itself owns 267,147 square metres (2,875,550 square feet) of rentable office space. Požarevac is a city and the administrative center of the Braničevo District in eastern Serbia. It is located between three rivers: Danube, Great Morava and Mlava. As of 2011, the city has a population of 44,183 inhabitants, while the city administrative area has 75,334 inhabitants. New Belgrade is a municipality of the city of Belgrade. It is the central business district in Serbia and one of the major ones in Southeast Europe. It was a planned municipality, built since 1948 in a previously uninhabited area on the left bank of the Sava river, opposite old Belgrade. In recent years, it has become the central business district of Belgrade and its fastest developing area, with many businesses moving to the new part of the city, due to more modern infrastructure and larger available space. 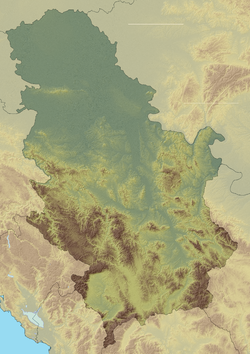 With 212,104 inhabitants, it is the second most populous municipality of Serbia after Novi Sad. Belgrade Nikola Tesla Airport or Belgrade Airport is an international airport serving Belgrade, Serbia. It is the largest and busiest airport in Serbia, situated 18 km (11 mi) west of downtown Belgrade near the suburb of Surčin, surrounded by Syrmia's fertile lowlands. It is operated by French conglomerate Vinci Airports. Stari Grad is a municipality of the city of Belgrade. It encompasses some of the oldest sections of urban Belgrade, thus the name. Stari Grad is one of the three municipalities that occupy the very center of Belgrade, together with Savski Venac and Vračar. Surčin is a municipality of the city of Belgrade. As of 2011 census, it has a population of 43,819 inhabitants. Hotel Jugoslavija in Belgrade is one of the oldest luxurious Serbian hotels. It is located in the Novi Beograd municipality. Bežanija is an urban neighborhood of Belgrade, the capital of Serbia. It is located in Belgrade's municipality of Novi Beograd, in the Syrmia region. Ušće is an urban neighborhood of Belgrade, the capital of Serbia. It is located in Belgrade's municipality of Novi Beograd. Ušće is located on the mouth of the Sava river into the Danube, thus the name. It occupies Novi Beograd's Blocks 10, 13, 14, 15 and 16 on the Sava's left and the Danube's right bank, covering a tip of land that overlooks the islands of Little War Island and Great War Island to the north and the old core of Belgrade, the fortress of Kalemegdan to the west. 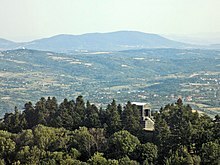 Ušće borders the neighborhoods of Staro Sajmište and Savograd on the south. As a compact grassy and forested area it stretches along the bank of the Danube into the Block 10, to the Zemun municipality and the Hotel Jugoslavija and the ENJUB shopping mall. 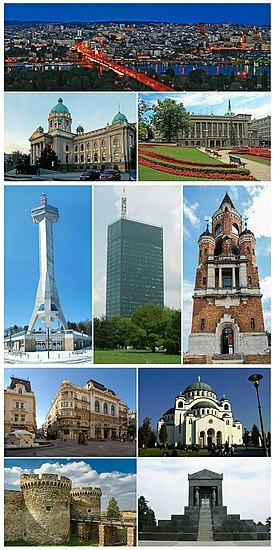 The city of Belgrade is divided into 17 municipalities. Agriculture in Serbia is still an important section of Serbian economy with an annual potential of EUR 12 billion in exports. The total area of agricultural land exceeds 6.12 million hectares. 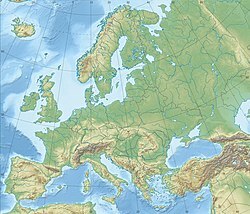 Agricultural production is most prominent in Northern Serbia on the fertile Pannonian Plain, and the southern lowlands adjacent to the Sava, Danube and Great Morava rivers. There has been in a sharp decline in agricultural activity since 1948, when almost three-quarters of the population engaged in farming, to the present one-quarter. BG Voz is an urban rail system that serves the city of Belgrade, Serbia. It is operated by the public transit corporation GSP Belgrade and is a part of the integrated BusPlus system. Old Railroad Bridge is a bridge over the Sava river in Belgrade, the capital of Serbia. It was the first railway bridge in Belgrade and today is one of two across the Sava, and three in general. King Alexander Bridge, in full The Bridge of King Alexander Karađorđević or The Bridge of the Knightly King Alexander, was a road and tram bridge over the Sava river, in Belgrade, capital of Yugoslavia. It was the first permanent road bridge across the Sava in Belgrade after almost 250 years and the Long Bridge from 1688. Finished in 1934, it was destroyed in 1941 during World War II. Its pylons were later used for the modern Branko's Bridge, built in 1956. The bridge was revered while existed being described as "gorgeous" and "one of the most important object ever built in Belgrade".